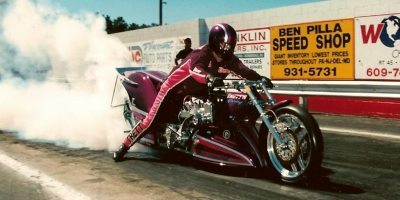 A racer recently, in social media, posed the question “Why do some professional dragbike racers do burnouts across the starting line?” An interesting question with a lot of merit in 2014, when now drag bike parts cost more than ever in the history of the sport. 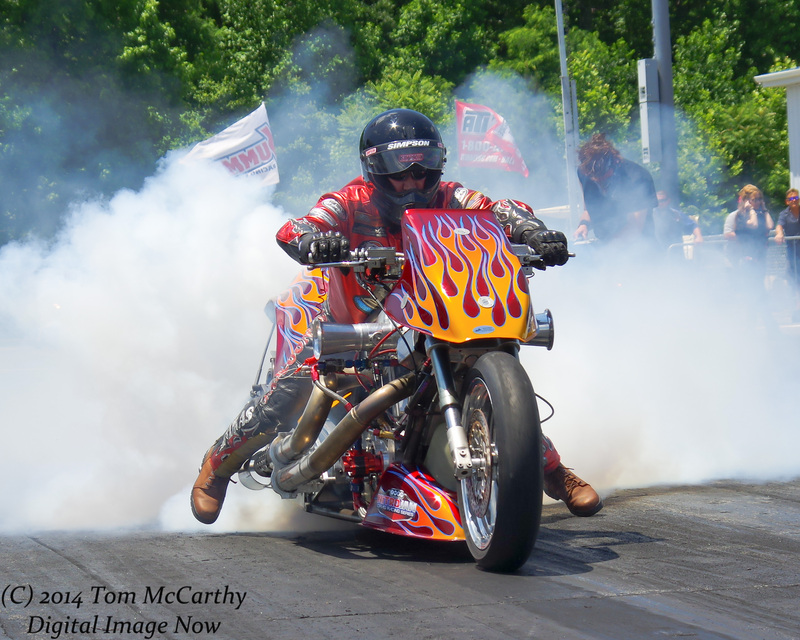 Professional drag bikes, especially the nitromethane powered fuel bikes, have the greatest operational expenses per/pass so we address the question; Why do some professional racers burnout across the starting line? The professional procedure of doing a burnout across the starting line originated from the practice developed in the 1960’s when fuel cars would rapidly spin their rear tires to heat them up and at the same time lay down a hot sticky patch of rubber across the starting line. Then their crew members would help back the car up with care – to keep the drag cars in their own tire tracks. They did this to add heat and traction to the rear slicks to enhance friction at the moment of launch. In time the drag bikes followed suit and as time marched on, the process of the across the stating line burnouts began. But there’s more to a good burnout than just heating things up to enhance traction. 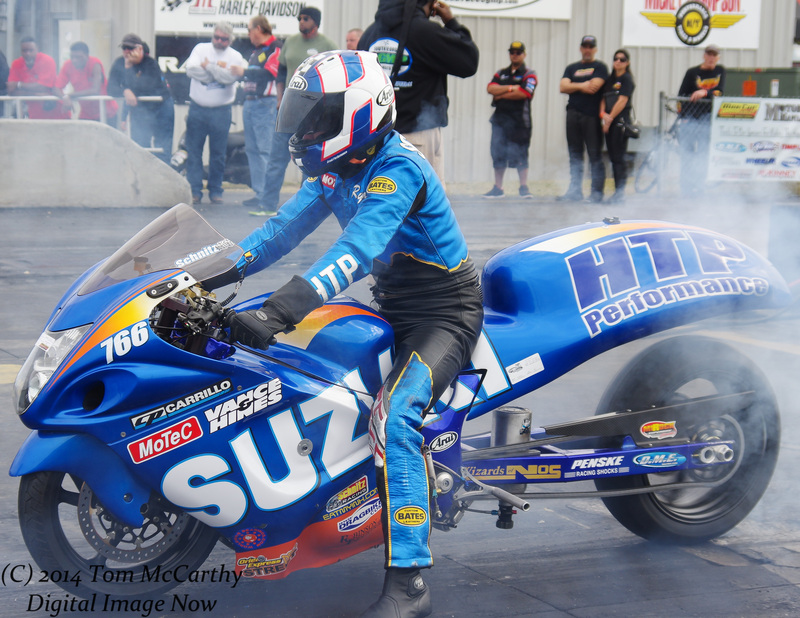 During a 1990’s interview with NHRA Pro Stock Motorcycle drag racing great Dave Schultz, Dave commented on the topic of doing a burnout: “Today’s drag tire technology is so good I think you could go to the line with no burnout and still grab the race track. But the burnout is sometimes more for the driver than for the rear tire. It settles you down, you adjust your focus and you’re dialed–in, ready to pull up to the starting line.” Dave also added to his comments by saying, “An even temperature across the width of the tire tread is desirable during burnouts. I always try to stay seated during the process and give the rear tire the same profile it will have when it goes to the starting line when I spin the rear tire during the burnout. We then take tire temps left-center-right of the tire before every pass.” Dave Schultz, it should be noted has 45 NHRA National Event wins to his credit and six NHRA Pro Stock bike championships that hold his name. 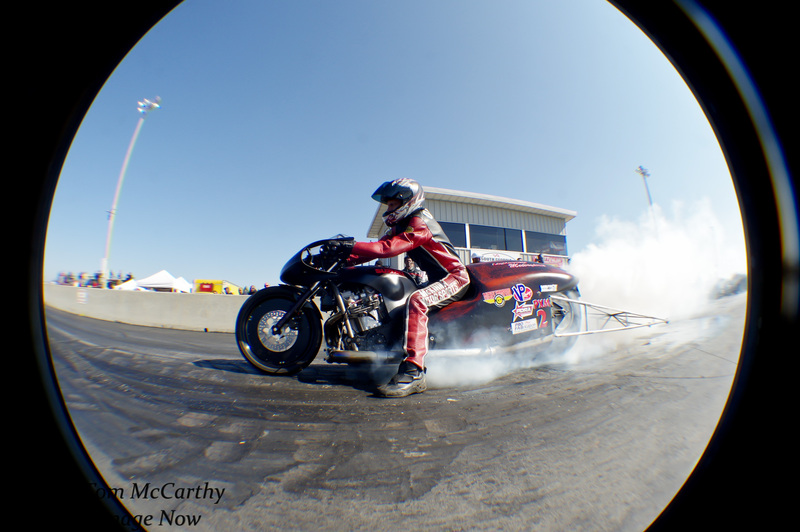 An important aspect of drag racing that is for the most part totally missed by today’s motorcycle drag racers, is the showmanship factor. It must be noted here that it’s not the fault of today’s modern drag bike racers, as they’ve not grown up in the Golden Era of drag racing; back when the sport was more about the show, and less about the go-factor. In today’s drag racing, with computer read outs, there is a second, by fraction-of-a-second accounting now available to racers in their quest for optimum performance that comes with every run. With today’s level of sophisticated data acquisition, professional NHRA drag racing teams can tell you exactly how many revolutions the crank shaft turned from the stating line to the finish line every pass. Crew chiefs can now tell you to the ounce exactly how many gallons fuel were expended from the starting line to the finish line. This is great for analyzing performance, but it’s gnawing away at the soul of the sport. 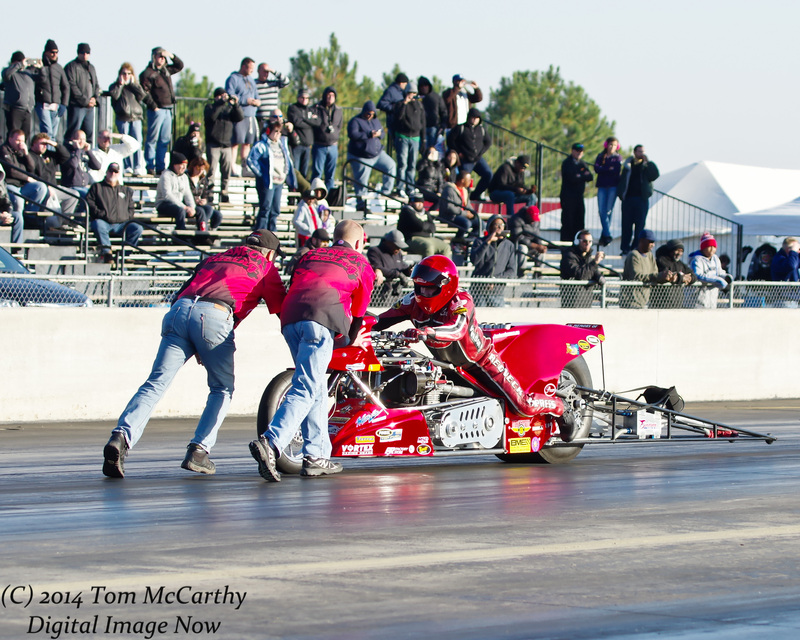 The very heart of drag racing suffers from this quest for optimum performance. You see there was a time in drag racing when drag racing was more about the sport of drag racing and less about the minuscule nuances that accompany every rotation of a crank shaft. 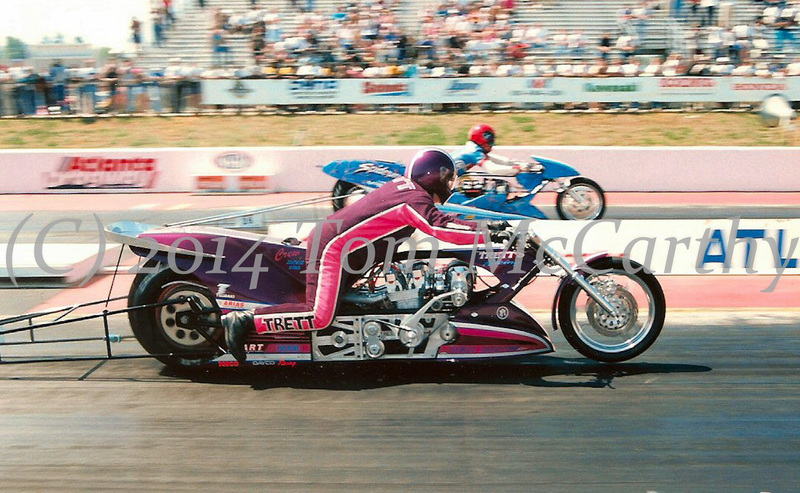 Too few of today’s motorcycle drag racers and drag racing fans have ever been to a “Cackle Fest” or have witnessed in person the spectacle of 32 nitromethane burning Funny Cars lined up on both sides of drag strip, with their bodies up and they all fire the motors at the same time. THAT’S DRAG RACING my friends, a motorsports show like no other. Showmanship today in motorcycle drag racing is for the most part somewhere between dormant, muted or dead, depending on one’s point of view. Let’s look back at a burn out sequence from a typical Joe Smith, Top Fuel Harley burnout from 1971 and compare that to a 2014 Nitro Harley burnout. In 1971 when Granddaddy Joe Smith was going to make a run, he would be suited up on his nitromethane burning Shovelhead, seated on the bike holding the handle bars with his left hand and holding the door of his 1964 white Ford pick-up truck with the right hand, while they were positioned on the return road, about to drive towards the starting line. When Joe nodded, his wife Pat would speed up their family tow rig to a speed of about 25 to 35 mph and Joe would let go of the truck and after getting both hands on the bars, he’d pop the clutch with the bike in high gear and light the motor off. Talk about drama on the fire up! Once the bike was lit, Joe would take his place in front of the tower in the bleach box (that’s a term few reading this will recognize) and Joe would await a signal from his opponent, or team mate if he was doing a show, and they would burnout in unison, putting on a hell of a smoke show for the fans. 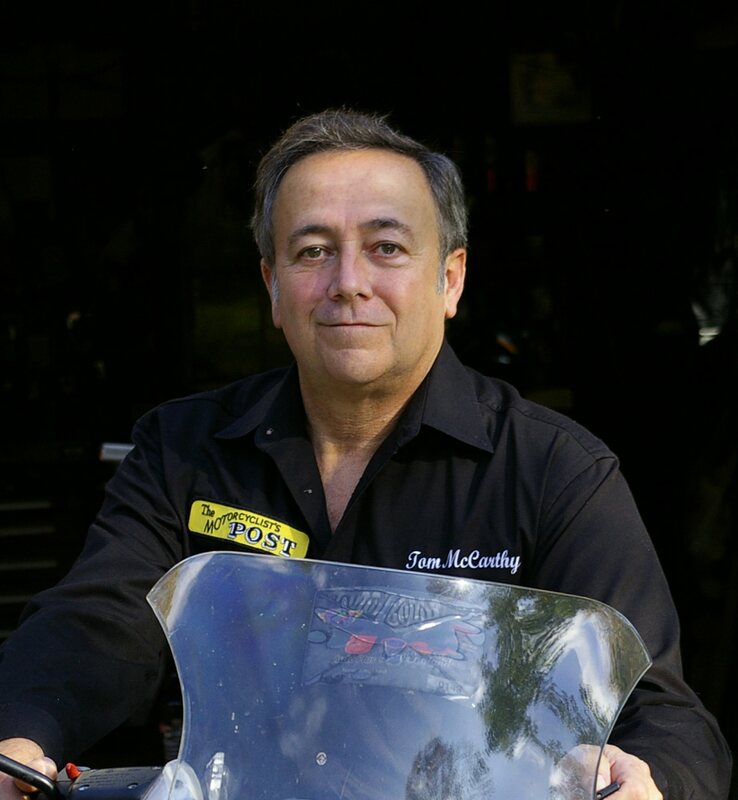 In fact Joe would some times do a trick where he would put his front tire behind his pick-up truck, against the rear bumper, and blaze the rear tire of the fuel bike, while the truck slowly rolled forward. To fans, it looked like he was pushing the pick-up truck with his fuel bike while blazing the rear tire! That’s showmanship my friends. Joe’s wife Pat was really rolling forward and Joe was keeping pace, but you get the picture and so did the fans. What did the bikes run? Who cares, they were cool as HELL out there! This my friends is what puts fans in the stands, the spectacle of drag racing, an assault on the eyes, ears, nose and throat of every spectator in the stands. It’s part of what makes drag racing great. Now compare this to a T/F Harley burnout in 2014 competition. In today’s Top Fuel Harley racing world, a racer is started by a starter cart, they pull into the water box, wet the rear tire, the front tire gets a quick wipe dry, racers nod to one another, they heat the tire for about 12 to 15 seconds and roll out of the smoke ready to stage. The whole process takes about a minute and is normally drama free unless something goes very wrong. This process is efficient yes, but it’s stark naked when compared to the Joe Smith show. Now consider a burnout sequence by the late Elmer Trett and Larry McBride from their match racing days. They would hit the water box together and wait when ready to race, while a track announcer pumped up the crowd. Then when they couldn’t drag the waiting out any longer, Elmer and Larry would have their teams fire up the bikes and again they would wait… making the fans uncomfortable … as they sat poised ready to strike. What Larry and Elmer are really doing at this point is stalling for time while their crews hoof it way down yonder to mid track, some 660′ away because they are about to get Medieval on their rear tires. They would typically use burned up older used rear slicks for this, but they would each do a few blips of the throttle, then grab a hand full with the bike in high gear, and boil the Goodyear across the starting line with vigor and they would not get out of throttle till they crossed the 330′ marker! This in effect would cause serious tire smoke to half track. Fans went crazy for this – yeah baby, that’s what they paid to see! Team members would then push the two superstars back behind the starting line and they would again, take turns blipping the throttle before pre-staging. Then they’d get to drag racing and who won didn’t matter. Who put on the better show mattered and in turn sold the most T-shirts and signed the most autographs mattered. It was about the fans, about the show, not about the motorcycle’s performance. There was a time in drag racing when “the show” mattered … and the fans mattered more than the button pushing performance of today’s cookie-cutter machines. Ashley Owens on his Pro Comp winning bike is in classic Dave Schultz seated fashion here producing good even heat across the tire tread for consistent, predictable launch results. Elmer Trett and Larry McBride did a bunch of match racing for fun and profit throughout the 1980’s and on into the 1990’s. When they did, it was always about the show for the fans when they lined up. The results as you can see are very varied as to why and how racers choose to do their burnouts as they do but one thing is for sure, fans love it and can’t get enough of it. This should be shared with ALL drag racers! Great article! I am impressed with your article !! Well put . Another great show was watching Phyllis push Jim back to the start line…. Many times when testing I would do a John Force burnout across the virgin start line to work in the VHT. You had to careful not to roll out of the throttle during the burnout or you would trash the auto shift transmission . Sure was fun to do! Great article The fans are dwindling away. pilots can put on a great show and still run good numbers getting the fans would be worth some broken parts.